Learning outside the classroom provides opportunities for both formal and informal educational experiences. Teachers know that the most meaningful learning often occurs through real-life, practical or hands-on activities. We hope you will enjoy your visit to Burghley House which can be inspiring and informative in so many ways and offers experiences which can not be replicated in a school environment. 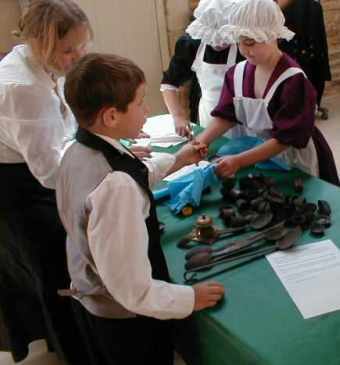 Burghley House is available all year round for school visits 10.00 – 2.30 Monday to Friday. We have storage space for packed lunches and rooms for children to eat lunch inside when the weather is inclement. At Burghley House our educational provision is intended to be inclusive for all, regardless of differences in gender, ability, disability, age, social background, culture or race. £8.00 (Incl VAT) per child for a House led workshop or Sculpture Workshop. £7.00 (Incl VAT) per child for a self guided tour of the House. £5.50 (Inc VAT) per child for admission to the gardens only. Please note that all these prices are inclusive of VAT which is chargeable, but which should be reclaimable if your school is a charitable institution. Teachers & accompanying supervising adults admitted free at a ratio of 1:5 for KS1 AND 1:8 FOR KS2. Additionally, we do no charge for and adults accompanying a child who requires 1:1 supervision. For pupils in the Foundation Stage & K .S. 1 a ratio of 1:8 is recommended.